I would buy this over again if I ever need to. It was much bigger than expected and very comfy/warm! Ultimately beautiful and warm, the Faux Fur Sherpa Backing Bed Blanket features a beautiful animal design or pattern for your bedroom. Also used as a Queen bed spread, one side of the blanket is pure soft microfiber fur that will never shed and on the other side is a Sherpa wool white cream backing that will keep you warm on cold nights. The thick BNF Home Luxury wild life blankets will give your bed or couch the fashion and style of animal print without actually taking it from a live animal. Because the blanket is made of microfiber, each cover will get softer in every wash and is naturally stain resistant. Plus these blankets are very easy to take care of, cold water machine wash and low tumble dry afterwards if you wish for the Faux fur to stroke to one side you can then iron with very low settings to give it the aesthetic design that you want. NOTE: In the image, the blanket is on a smaller bed to see blanket patterns better. Please review the size. Dimensions 92.0 In. X 84.0 In. X 1.0 In. I bought this for our guest bedroom to go with a western theme. I had all the pieces except for a blanket. Not only does it look great, It is the most comfortable blanket ever. Both sides are soft. Great blanket and great price. Was a gift for my son and I the opportunity to lay on it. This fits a queen size bed and it makes you feel like a baby laying down for a nap. It's extremely soft and enjoyable. I wish it came in bigger. Oh so soft, warm...and yet, not a heavy blanket. Washed easily and retains shape. Heavy and beautiful! It makes my neutral colored bedroom POP! Also, because it's animal-print, it will go with almost any color palette. 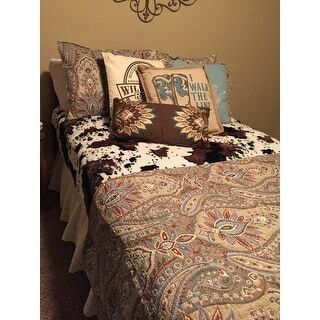 Love this throw! Absolutely beautiful blanket and soooooooo soft! Much nicer than I expected. Both sides are soft, and it's a heavy blanket. I might need to buy another one! It’s beautiful and plush and soft and warm!!! This was a great buy! It really covers my bed too! Usually a king looks like a queen but not this one! This is a beautiful blanket and so so soft! I ordered the cow print for my cow obsessed daughter. But everyone fights to have it in the living room. Nice and big and warm and oh so soft. This keeps the cold nights at bay!!! I don't know in what world this is king sized. It didn't even cover my king sized bed. It seemed to be really cheaply made. I ended up returning it. Very disappointing. This was purchased as a birthday gift for a friend. She was thrilled with her "giraffe" blanket. It was warm, soft and very well made. It's good quality and soft- beware it's VERY warm. Love it. Very soft and comfortable. Got it in cheetah print. Looks great on my bed. Awesome Christmas gift! My daughter loved it! "I would like to order the one that's called cows flower but seem unable to select it to put in my car regardless of the size. I'd like to buy either size if possible. please let me know if they're sold out and I am unable to purchase them thank you"
It matches my cow pillows and rugs. Because my husband wanted one for his birthday. I like that it is sherpa lined. "Do they have Plllow cases tha I can get to match the Leopard Blanket I bought"
"Do they have pillow cases to match ( Leopard )"
The blanket does not have matching pillow cases available.